An Ji Bai Cha Green Tea is a special green tea that contain an amount of amino acid, which is calming to the nervous system. 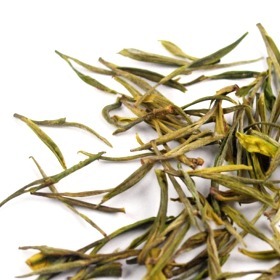 An Ji Bai Cha Green Tea grows in a very sandy, rocky and rich in minerals soil. This environment has a powerful impact on the An Ji Bai Cha Green Tea. Hence, the tea cost higher than the rest of the green tea. An Ji Bai Cha Green Tea is definately a previous and limit tea harvest each year. An Ji Bai Cha Green Tea is also one of China national tea. An Ji Bai Cha Green Tea - A must try tea! This tea taste is very clean and sweet. Flat and straight green leaves. I love this green tea. A first rate tea! Very High quality! It's expensive, but I can see why. it remember me the Monkey king tea: with orchid fragrance, but sweeter, and not so delicate as someone says. Ill order again.